Happy November! I am obsessed with Twitter. I've been using it, albeit with different accounts, since 2009. One thing I miss is Follow Friday, but I decided that once a month, I'd like to do an equivalent. I am going to suggest six accounts that I love that you should check out if you're looking for more fun, interesting people on your feed. But before I get into the list, I want to pimp my own social media accounts for this blog. 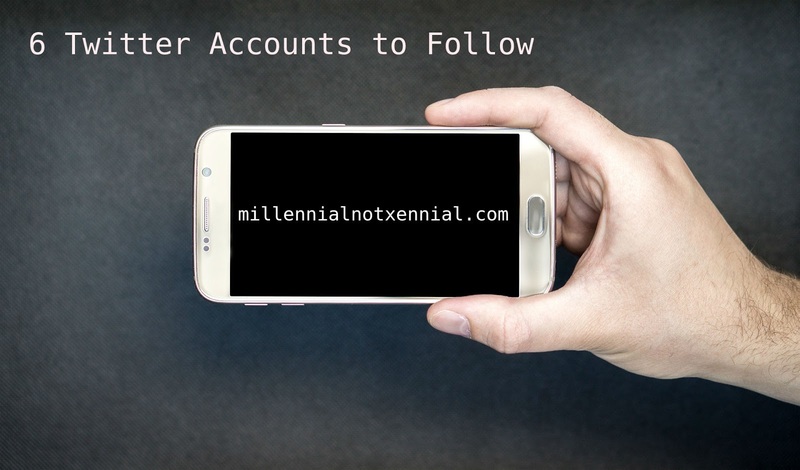 The Facebook is @millennialnotxennial and the Twitter account is @notxennial. I'm thinking about adding an Instagram, but in the meanwhile you should follow those accounts if you'd like. I would also like to throw up a disclaimer that because of the weird political climate in the world right now, literally everyone gets political at some point on Twitter. If you're not down with that - why are you on Twitter? Now, without further ado, six Twitter accounts that aren't me to follow. Jill Twiss is a "Last Week Tonight with John Oliver" writer, and co-writer of the better Bundo book, A Day in the Life of Marlon Bundo, but she's also a relatable and real human being. She's the reason I finally got around to watching "The Good Place." She's been urging people to get out to vote and offering help to make sure they can. She is a treasure. Hello, as that I am laid up on painkillers after spending today at the dentist, I would like to tell the story of the that I was informed by my building’s super that I had two rotten chicken breasts under my mattress. Settle down and prepare to think less of me. Look, we're all Millennials here. Who among us didn't have a crush on Devon Sawa? The lesbian women and straight men, maybe, but even then - sexuality is fluid and are you sure? And his Twitter account is just lovely. He's smart and he's funny. Just explained to my five-year-old what a Dutch oven is. He’s mesmerized, to say the least. Next up: crop dusting at a movie theater. There's something I'm not even going to try to hide - I am obsessed with Internet Comment Etiquette. I am one of his many Patreons. I've seen all the lessons at least five times. If I can find a way to fit him on a list, I will. He is just so funny and smart, which are qualities I find to be irresistibly attractive. He's a little crass, which is my kind of humor, but his Twitter account is always delivering. I have a favorite podcast investigative journalism program, and it is Whatever Happened to the Pizza At McDonald's. As an older Millennial, I remember both birthday parties and pizza at McDonald's. I'm proud of Brian Thompson's investigative efforts, and hope he can find the actual truth as to why McDonald's stopped serving pizza at McDonald's, which could be the gateway to bringing it back. Loving Michael C. Maronna's Twitter isn't a Millennial thing, even though it could be - he's Big Pete Wrigley. No, loving Michael C. Maronna's account is because when I was younger, one of my favorite pasttimes was trolling trolls. It is so funny to see their schtick backfire and see them get so mad. Michael C. Maronna had the same troll going for a month back in September and it was hilarious. He also has a podcast with Danny Tamberelli, which is a Millennial thing. So those are the six Twitter accounts that I think you should at least check out. Are there any Twitter accounts you're totally loving? Let me know!